New England Patriots tight end Rob Gronkowski announced his retirement from the game at age 29. But while Gronkowski’s announcement came as a shock to the sports world, he’s not the first player at his level to retire young. Several star athletes have retired before the age of 30; here’s a look at the five best. As a disclaimer, this list does not include athletes who made a comeback after retiring at age 30, or from sports that a competitor retiring in their 20s is common (i.e. gymnastics). Brandon Roy was an All-American at Washington before winning NBA Rookie of the Year in 2007 with the Portland Trail Blazers. He averaged 20.2 points and 5.0 assists per game over his first four seasons with Portland, was twice named All-NBA and made three All-Star appearances. Kobe Bryant once called Roy “the hardest player to guard in the Western Conference,” saying the guard’s game had no weaknesses. Knee injuries, which had bothered Roy since college, caused limitations during the 2010-11 season before Roy announced in the following offseason that he had been diagnosed with a degenerative knee condition and would retire. Roy attempted a comeback in the 2012-13 season, but played just five games for the Minnesota Timberwolves before re-injuring his right knee and retiring for good at age 28 in 2013. After the high level of play shown in his first four seasons, Roy’s career is one of the great what-ifs in recent basketball history. “Gronk,” known not just for his incredible play on the field but for the fun he had both on and off the field, retires as arguably the greatest tight end in NFL history. Gronkowski’s 79 touchdown receptions in just nine seasons are both a Patriots franchise record and the most by any NFL player since he came into the league, and he led the league with 17 receiving touchdowns in 2011, a rare feat for a tight end. He holds the all-time playoff records for a tight end in receptions (81), receiving yards (1,163) and receiving touchdowns (12), helping lead the Patriots to five Super Bowl appearances and three championships during his tenure. The only thing Gronkowski has struggled with is injuries, as he hasn’t played all 16 games in a season since 2011, and perhaps that played a role in his decision to retire. He will turn 30 in May. Despite a short career, Belgian tennis star Justine Henin won seven grand-slam titles and spent 117 weeks ranked No. 1 in the world. Her seven grand-slam titles came between 2003-07 and included four French Open titles and two U.S. Opens. She reached the final of all four majors in 2006 and is the only player in history to win consecutive French Open titles without losing a set (2006-07). Henin retired abruptly and immediately as the sitting World No. 1 in May 2008, citing fatigue. She made a comeback in 2010 and reached the Australian Open final, losing in three sets to Serena Williams, but after reaggravating an elbow injury opted to retire again in January 2011 at age 28. Bobby Jones was the greatest amateur golfer of all-time — he never turned professional — and had one of the greatest careers in the history of the game, all accomplished in a short timespan. By modern standards, Jones won seven major championships — four U.S. Opens and three Open Championships. But by the standards of the day, when the U.S. Amateur and British Amateur were considered as majors, he won 13 major championships. Jones won what was then considered the Grand Slam — the U.S. Open, the Open Championship, the U.S. Amateur and The British Amateur — in 1930, and retired from competitive golf at age 28 following the feat. After Jones co-designed Augusta National with Alister McKenzie and co-founding The Masters, Jones did play in the first 15 Masters tournaments, but only on an exhibition basis; his appearances helped attract media attention to the event, helping it become what it is today. Jim Brown is widely considered one of the greatest NFL players of all-time, yet he walked away from the game while he was still in his prime. In nine seasons, Brown led the league in rushing yards eight times and in rushing touchdowns five times. He was named NFL MVP in 1957, 1958 and 1965, his first, second and last seasons. 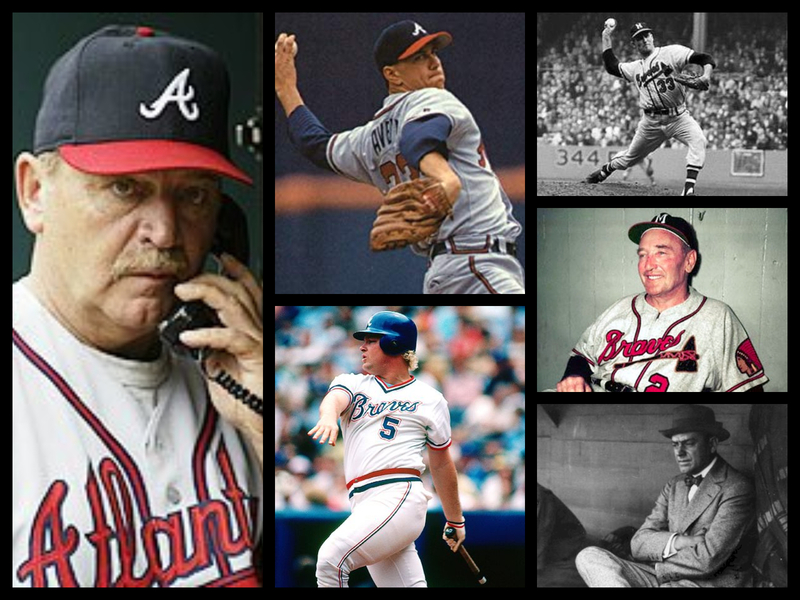 Brown played his final game at age 29 and retired before the 1966 season to pursue an acting career. At the time of his retirement, Brown had the most rushing attempts (2,359), yards (12,312) and touchdowns (106) in NFL history, and he remains the record-holder for most career rushing yards per game (104.3). Despite his short career, The Sporting News named Brown the greatest NFL player of all-time in 2002. He is not only in the Pro Football Hall of Fame, but also in the Lacrosse Hall of Fame after a stellar collegiate career at Syracuse. Think back to when you were growing up and faced the daunting task of doing something new, scary and daring. If you’re like me, you may have been more likely to feel comfortable enough to go for it if you saw one of your peers finish the task first — whether it was riding a bicycle without training wheels, diving into the deep end of the pool or riding on the zip line at summer camp. For 16th-seeded Gardner-Webb, North Dakota State and Iona as they entered the 2019 NCAA Tournament, last year’s UMBC team may very well have been that peer. Fifty-two weeks ago the Retrievers shocked the world by becoming the first No. 16 seed to defeat a No. 1 seed in the tournament’s first round when they beat Virginia 74-54, a feat previously thought by some to be impossible. Sure, the Cavaliers, Blue Devils and Tar Heels posted dominant second halves to win and advance (Virginia beat Gardner-Webb 73-58; Duke topped North Dakota State 85-62; North Carolina defeated Iona 88-73). It should be expected that this would happen in these games considering the talent gap between these No. 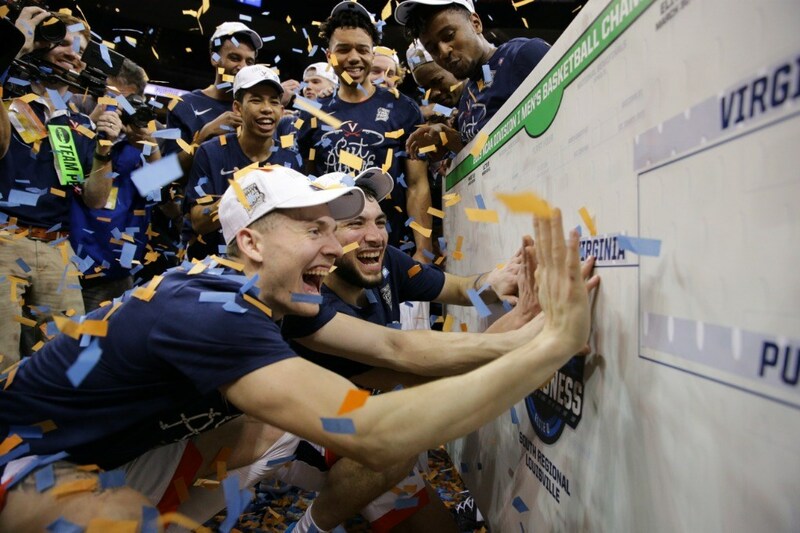 1 seeds — by definition the best teams in the country — and their 16th-seeded counterparts. The ability of great coaches to make halftime adjustments — and UVA’s Tony Bennett, Duke’s Mike Krzyzewski and UNC’s Roy Williams all fit that description — is also a factor in the games turning back towards the favorites, even after two of these three No. 1 seeds trailed at halftime and the other was up by just four points. But as Gardner-Webb, North Dakota State and Iona each played on Friday there was a sense that the teams had a new sense of confidence never seen before in 16-seeds, knowing now that beating a No. 1 seed was not just something that hypothetically could happen, but something that has happened. It started in mid-afternoon as Gardner-Webb held a 28-14 lead on Virginia — the very team that lost to UMBC last year in the tournament’s ultimate upset — before the Runnin’ Bulldogs led 36-30 at halftime. Surely thoughts of last year’s game and all the noise surrounding it since had to creep into the heads of the Cavaliers, though Bennett’s club responded with their typical stanch defense, holding Gardner-Webb to 20 second-half points. North Dakota State led 12-5 early and was tied with Duke as late as the 2:13 mark of the first half before trailing 31-27 at the break. Duke — the No. 1 overall seed and the tournament’s largest betting favorite in four years — used a 33-10 run to start the second half and put the game out of the Bison’s reach, scoring 54 second-half points en route to the second round. Iona hit 10 threes in the first half to take a 38-33 halftime lead over North Carolina. The Tar Heels outrebounded the Gaels 52-26 for the game and Iona made just five of 20 threes in the second half, instigating a 30-9 UNC run that allowed them to cruise to the win. While each of these three No. 16 seeds lost in the end, they all have nothing to hang their heads about and can be proud of the way they competed. Each of them took their best shot at an excellent opponent and provided them with a stiff first-round test — something that has often not been the case in past 1-vs-16 matchups, as the average margin of victory by 1-seeds over 16-seeds since 2015 is 26.8 points, with nearly half those games decided by 30-plus points. While any reasonable pundit won’t expect 16-seed-over-1-seed upsets to become a normal occurrence, this year’s crop of three compelling games and three legitimate upset attempts could be a sign that the days of pushover 16-seeds may be history. Because while facing a No. 1 seed is a daunting and scary task, they’ve now seen one of their peers finish the job. Over the last week, I’ve had the incredible opportunity to cover the 250th and 251st meetings of Duke and North Carolina on the basketball court. But while last Saturday in Chapel Hill I covered a collegiate basketball game between Duke University and the University of North Carolina, it wasn’t until Friday night at the ACC Tournament in Charlotte that I truly saw a Duke-UNC game. Don’t get me wrong, the game at the Smith Center was quite an experience. Emotions were high — not just because of the rivalry but because of Senior Night for three likable players who have spent their careers endearing themselves to the UNC fan base — and the atmosphere was terrific. The cheer for the first UNC basket was the loudest cheer I’d heard to that point in the four UNC home games I covered this year, and only got louder from there, especially as the Tar Heels pulled away in the second half and held on for the 79-70 win. But Friday night at the Spectrum Center in uptown Charlotte I witnessed a game truly befitting of the Duke-UNC rivalry, and one that none of the Spectrum Center-record 20,116 in attendance will ever forget. It was (despite some poor shooting numbers) a game played at an exceptionally high level, a game that every possession — especially in the second half — felt immensely and increasingly important. A game with two teams so evenly matched they changed the lead eight times and neither team led by more than five points over the last 15:15 of breathtaking action. And it was a game that one Zion Lateef Williamson came to play. The Duke freshman phenom — injured 36 seconds into the first meeting and absent in the second, returning to action just this Thursday — scored 31 points with 11 rebounds, including nine of the last 11 points the Blue Devils scored, and gave Duke the lead for good on a putback of his own miss with 31 seconds left, securing a 74-73 victory. 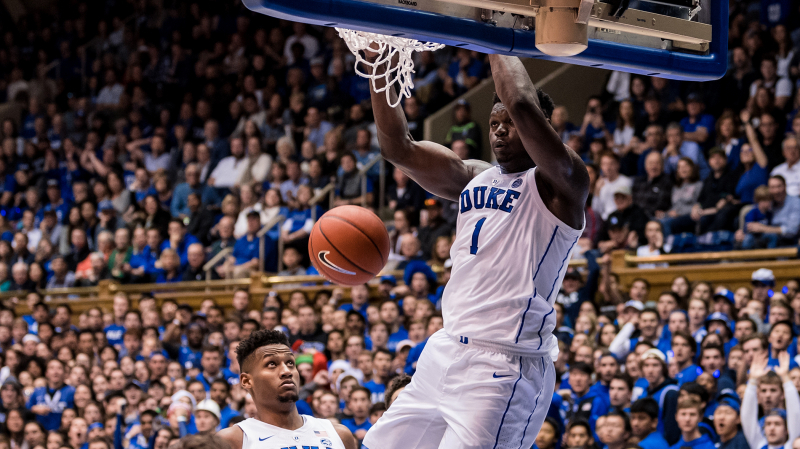 While the season’s first two meetings were remarkable in their own right — as Jay Bilas says, Duke-UNC always delivers — their drama and tension paled in comparison to the marvel of the tertiary game. That was partially due to the heavyweight-bout-like game unfolding in front of a boisterous bipartisan crowd. It was partially due to the highest stakes these teams have had in any game all season, seeking a berth in the championship game at the granddaddy of all conference tournaments. And it was partially due to the sheer presence of Williamson. In the first two meetings, with Williamson missing, it was clear as could be that the Tar Heels were the better team. Nine- and 16-point wins were the result. Friday night, with Duke finally near full strength (sans Marques Bolden) and UNC seeming to peak at the right time, as Roy Williams’ teams so often seem to do, the two teams put on a performance that was worthy of a national final, far above the expected level for a conference semifinal. And who knows, with the skill levels of the two teams and the March pedigrees of the two programs perhaps a fourth meeting in the national final, or at least the late stages of the NCAA Tournament, isn’t too far-fetched. But unless that happens — and even if one of the teams cuts down the nets in Minneapolis in three weeks — one of the clear and enduring memories of this season for fans of both teams will be Friday’s game, one of the greatest chapters in a Duke-UNC book full of legendary installments. In many ways it was a perfect storm: the greatest rivalry in college basketball being played on a neutral floor in the state of North Carolina’s largest city, with ACC championship aspirations on the line along with UNC’s wishes of a three-game season sweep of Duke for the first time since 1976, all in what will very likely be the only real appearance in the rivalry for the most explosive and dynamic college basketball player in many years. Duke-UNC transcends the realms of a typical college basketball game. Williamson transcends the realms of a typical college basketball player — even of a typical college basketball star. The result was a game that a couple of columnists that have covered the ACC for many years called the greatest and second-greatest games they’d ever seen live (with one ranking the 2017 UNC-Villanova national final first). Sure, I saw Duke and North Carolina play last week. But Friday night I was truly introduced to the rivalry, as I saw an absolute classic that will live on in Duke-UNC lore. The entire narrative of the season’s first meeting between North Carolina and Duke changed a half-minute into the game on Wednesday night. Duke star Zion Williamson’s shoe came apart as he tried to plant his left foot, and his slide on the floor resulted in a mild sprain of his right knee, from which he didn’t return. Quickly after the injury, I thought about what would happen if North Carolina won the game without Williamson on the floor for Duke for all but the game’s first possession, and I could immediately imagine how much the national sports media would use the injury as the exclusive reason for the game’s outcome should UNC win. The Tar Heels did win, earning an 88-72 victory for their fifth win in the last eight games in the rivalry, giving UNC coach Roy Williams a record eighth win over an AP No. 1 team. There’s no question Williamson’s injury changed the game. It would be impossible for the loss of a national player of the year candidate to not be felt. But consider who UNC did beat on Wednesday night: a Duke team that still featured three exceptional players in Tre Jones, Cam Reddish and RJ Barrett, the latter two of which are projected as top five picks in the NBA Draft. The last time Williamson went out with an injury, missing the second half at Florida State, Duke still found a way to win over the Seminoles, who six weeks later have the ACC’s longest winning streak at eight. Yet Wednesday, UNC beat the Blue Devils handily on their home floor, in arguably the hardest building in college basketball to win in as a visitor. “We knew coming in how good they were – and they were that good tonight,” Duke coach Mike Krzyzewski said. The Tar Heels outscored Duke 62-28 in the paint, assisted on 20 of their 38 made field goals and held Duke to 25-for-72 from the floor (34.7 percent). UNC’s Luke Maye scored 30 points with 15 rebounds – becoming the sixth Tar Heel with five career games of 30-plus points and 10-plus rebounds – and Cameron Johnson scored 26 points with seven rebounds and four assists. Maye’s performance was likely aided at least some by the absence of Williamson on the interior. But the fact is, both Maye and Johnson played tremendous games, something even Coach K acknowledged. “They played well – especially their two veteran guys, they played really great,” Krzyzewski said. There’s no question Duke did not play well – they shot 8-for-39 (20.5 percent) from beyond the arc, committed 20 turnovers and only had nine assists. Some of their issues, particularly in the post, can be at least partially blamed on Williamson being absent from a game after the Blue Devils game planned under the assumption he’d be playing. But anyone who asserts that Williamson’s injury is the only reason North Carolina won didn’t watch the game closely enough. UNC led by as many as 22 points and Duke was never closer than 13 over the game’s final 17:25. The Tar Heels went to Cameron Indoor Stadium and beat the No. 1 team in college basketball. Duke is the top-ranked team because of more than just one player and is probably still a top-five-caliber team without him. UNC deserves credit for earning the victory, and doing so convincingly. Even while beating a weakened Duke team, it’s still the Tar Heels’ best win so far in a very strong season.